Our neighborhood has many Historic Buildings, but some empty lots as well. 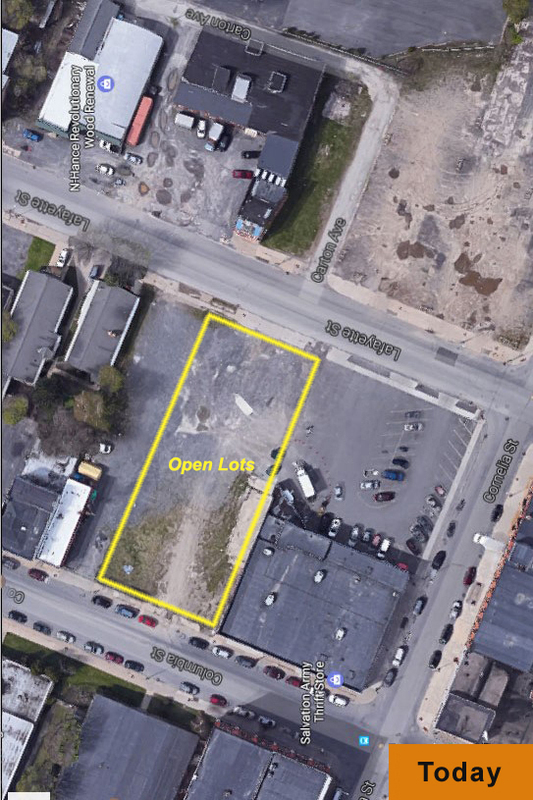 The empty lots are largely a result of failed Urban Renewal Projects at the hands of City Hall and Oneida County economic development agencies. A variety of smart "infill" projects (Just Like Portland, OR), many mixed uses - not a huge hospital, will make the Columbia-Lafayette Neighborhood prime and highly productive real estate. 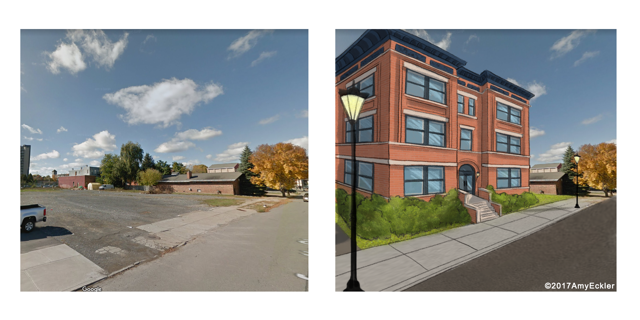 Below we've illustrated a surface parking lot and a condo development modeled after Utica's "Genesee Courts". BUD will investigate an updated version with modern amenities in a format suitable to these parcels. BUD will become, find, and inspired real estate investors and investments. Downtown Utica would net a Condo full of new - taxpaying - residents! 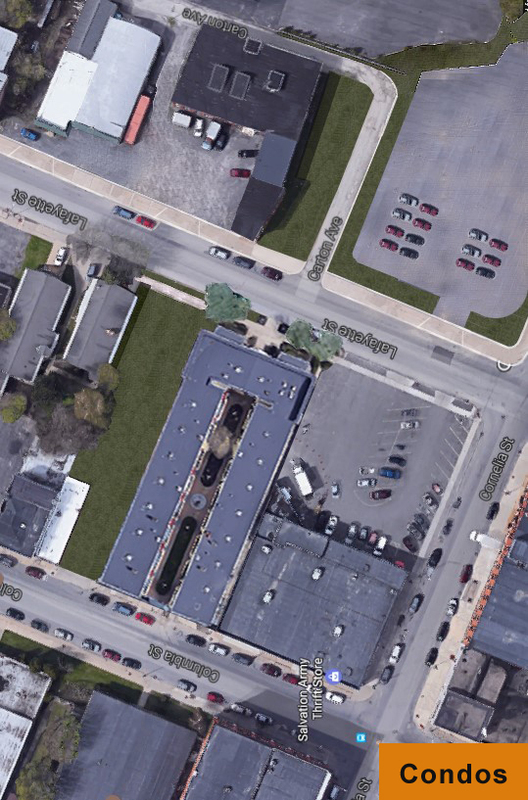 With surface parking as shown, or perhaps "basement" parking. All within easy walking distance to many great downtown assets. BUD imagines people living downtown in a 24-7 neighborhood and city. 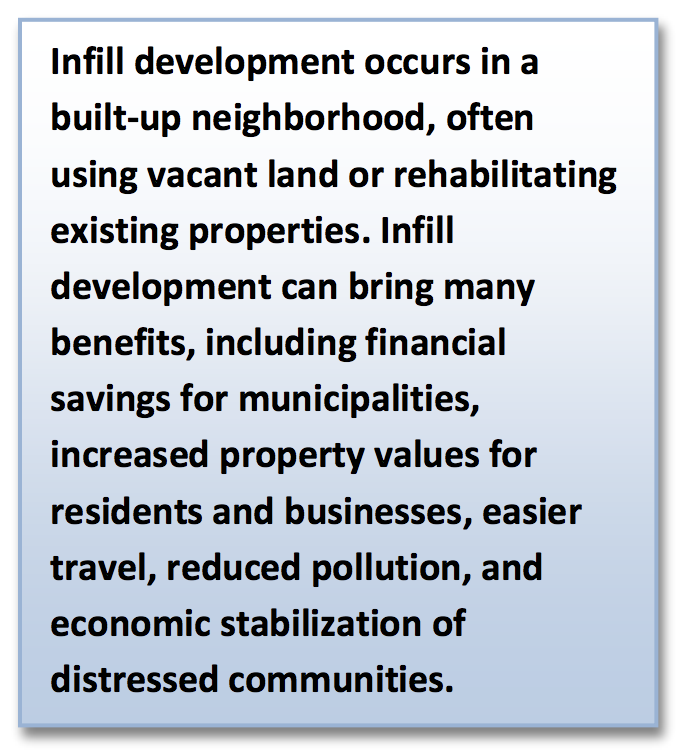 Just look at Other City's "Infill" Projects, "Infill" is the green and sustainable approach to redeveloping Downtown Utica. Know someone ready for such a residence? We do, and BUD can put you in-touch with people now living in Genesee Courts. Per this Utica Observer-Dispatch article, Genesee Court: Utica’s hidden gem. We believe condos would fill quickly; the community has already embraced new energy and is primed for more great possibilities. Now home to 40 businesses, the Columbia-Lafayette Streets can also become an inspiring, sought-after, neighborhood! The key to Downtown Utica economic development is many more residents, those that go to work and come home at 5pm. They will make the city vibrant.